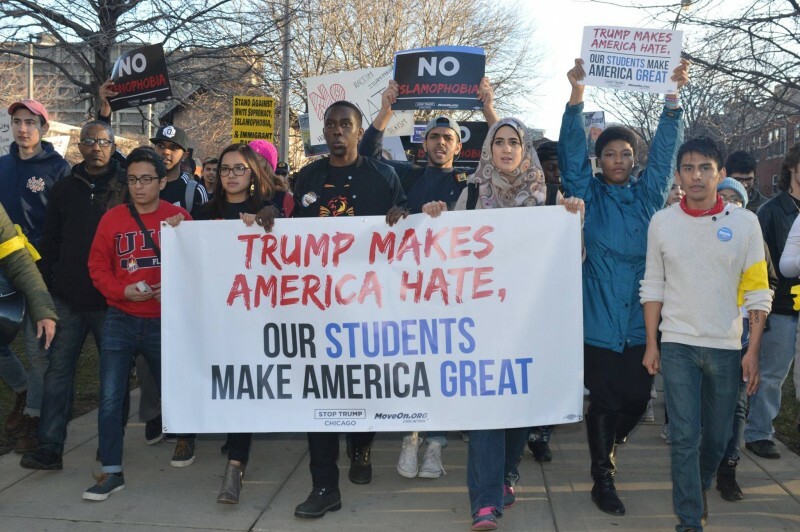 How students in Chicago organized to shut down Trump | Fight Back! Chicago, IL - The announcement of Donald Trump’s visit to the University of Illinois at Chicago (UIC) came one week before his scheduled, March 11 appearance. Within minutes, there was a Facebook page announcing plans to protest. There was also a moveon.org petition calling on the administration at UIC to cancel the rally. By later that afternoon, over 5000 people signed up to protest, and by later that night, 50,000 had signed the petition. The gathering of student leaders on Mar. 7 wasn’t full of movement veterans. There were 15 or 20 members of Students for Justice in Palestine, who had experience winning a vote in the student government for divestment this semester. But during the meeting, when the question was raised, “How many people here have been to a protest?” 20 of the 100 students present raised their hands. Then the question was asked, “How many have organized a protest?” only a few hands went up. One of the hands was that of Ethan Viets-Van Lear. Viets-Van Lear is a member of Black Youth Project 100, and was part of the We Charge Genocide delegation that went to Switzerland in October, 2014. There, they testified to the United Nations Committee Against Torture about the Chicago Police Department. Cassie Robledo, a member of the College Democrats, said, “My first protest was when I was 12. My dad and uncles are members of the Steel Workers Union. They took me to the megamarch for immigrant rights.” But the protest against Trump was the first time she was organizing anything like this. The students agreed to support two sets of tactics: one inside the Trump event and one outside. It became clear within the meeting that the main drama would be the protests taking place to disrupt Trump’s speech. Cassie Robledo was going in. Usama Ibrahim of Muslim Students Association intended to go in as well. Another veteran of past protests, Nathaniel Lewis, a grad student in public health, was incorporated into an informal leadership group for the inside group. Communications were set up, including the use of the app Signal, which allows for encrypted communication. A plan was hatched for the groups planning to disrupt to be organically developed, and then coordinated by dividing up the period of the Trump rally into ten minute intervals. The tactics for the mass march and rallies outside the Trump event venue were debated during the meeting. Given that the protest was only four days away, there was an emergency character to the planning. There was tension in the room. But after a wide-ranging debate in which more than one third expressed their views, the organizers were able to present a plan which united the room. It was agreed to have only a few speakers. The rally was emceed by Viets-VanLear, also a spoken word poet, who helped keep it short and lively. The plan was to attempt to take over Harrison Street and then march to the corner with Racine. The police had placed metal barricades in the median in Harrison. As the crowd marched across campus, it swelled to several thousand people. When it reached Harrison, the tactical leadership of the march made the call: They would take only one the eastbound lane. The barricades were locked together, and once separated into two lanes, the protest would be divided. The next challenge was dealing with the Chicago Police Department (CPD). In meetings with the administration earlier in the week, Juan Rojas reported, “They told us that we had to go to the parking lot across the street from the Pavilion.” One activist with SEIU Local 73, the main union on campus, called the lot a “cattle pen,” because it was surrounded by high, wrought iron fences. As the ever-growing crowd got within sight of the Trump crowd lining up at the Pavilion, CPD bike cops blocked the street, trying to force the front of the march to divert into the parking lot. Ethan Viets-Van Lear, Juan Rojas and Bear Steck, the tactical leadership group, stood firm. “We have the right to confront the hate that has come to our campus,” said Rojas. The marchers stood their ground and kept up chanting. Meanwhile, at the intersection, another 1000 anti-Trump protesters had gathered on the corners, behind barricades. Jerry Boyle of the National Lawyers Guild, a legal observer, explained to the police, “Those people have moved into the intersection, and are marching east to meet the larger group.” At this point, the commander realized that the bike cops were surrounded, and pulled them out of the intersection. The front line of the march cheered, and surged forward to meet those waiting in front of the main doors to the venue. A rally was then held just in front of the Trump crowd standing in line. Over the next two hours, the police would have to retreat two more times as the protesters demanded to take the entire intersection so that those speaking out could be heard by more of the anti-Trump group that stretched back over a block along Harrison.